My 1.6 VW engine is getting tired, so I have to do something. I have the choice between rebuilding my engine, buy a rebuild engine, OR swap the engine to a watercooled one. Because the first to options where quite expensive AND the quality of engine parts and rebuilds is getting worse, I decided for the watercooled one. It will cost me roughly the same (maybe a little less) then the vw engine, but I would gain horsepower, smoother running (fuel injection) and it will produce less engine noise. Plus I would have a heater without a slight smell of exhaust fumes. 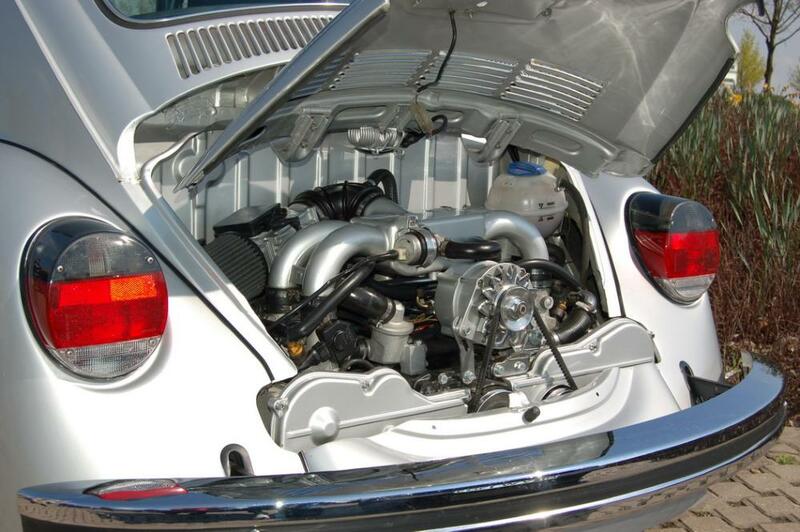 Another plus would be running the beetle on the freeway at 120 km/h knowing that this engine should be able to do this without problems. fit engine to the engine bay, I’ll have to cut away (part of) the bumper brackets. At first I had the radiator in the back, but this didn’t work on the highway (read more about it here). Now I am putting the radiator in the front. Yes it is worth it. It makes the beetle much more useable and fun to drive. But, it is ot a project you can do in a weekend, it will take time, and you need a place where you can work on it. as passionate Alfisti and someone who wish for himself also an classic VW Beetle Cabrio, this would be ideal choice! now, I would only like to use the 1.7L Alfa Romeo boxer with 16 valves. that is 129 PS rocket! I had both 1.4 and 1.6 boxers on 146 Alfas, but both were 8 valve machines and petrolhead like me can notice that. But the 16 valve will be a even more difficult fit in a VW beetle. The distribution covers are wider which means it doesn’t really fit. Allthough the one in the picture is very nicely done. Great story! But why aren’t you a member of Scuderia Non Originale? Great idea and great project man really appreciate all the info and hard work.. I used the VW beetle gearbox. At first I used the longer geared AT gearbox, but then I switched to the lower geared AM gearbox. The lower gears suit the higher revving engine better. Nice job! I have a 1.5 Alfa engine with carbs and distributor which I want to put into the back of my 1970 Bay Window bus. 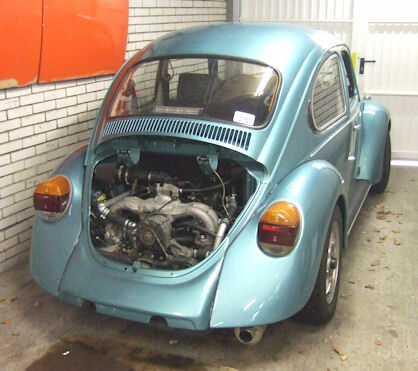 Do you know if I’d need to use the VW clutch, starter motor and flywheel or the Alfa ones? That depends on the adapter kit you’ve got. But with both kits, you will use the VW clutch and pressure plate. If you get a kit that only works on Alfa engines with a distributor, you will need the VW beetle flywheel and the VW beetle starter motor. This kit will contain a adapter plate (with VW and Alfa bolt pattern), and a spacer between the engine and the flywheel to bring the flywheel closer towards the gearbox. If you get the kit that works for fuel injected engines (with a TDC, top dead center, sensor), you will need the Alfa Flywheel and Alfa starter motor. This kit will contain a adapter plate (with VW and Alfa bolt pattern), and a large disc that will be bolted to the flywheel on the gearbox side. To that large disc, the clutch and pressure plate will be bolted. Because the fuel injected engines need a TDC sensor, the Alfa flyhweel has teeth to provide the signal to the sensor. That’s why you have to use the Alfa flywheel with these engines. This last kit is the one I use, and I also had to bring my Alfa flywheel to DS-tuning too because it had to be machined. These are the two kits that are sold by DS-tuning. There was also a kit sold in England, that consisted of a adapter plate (with VW and Alfa bolt pattern), and a longer gearbox input shaft. This meant you had to dismantle the gearbox and install the longer input shaft. The longer input shaft had the same function as the spacer or disc in the DS tuning kits: it dealt with the bigger distance between the VW gearbox and the Alfa engine compared to the VW gearbox and VW engine. The kit also had a spacer for the throwout bearing to overcome the distance. It used the Alfa Starter motor, and (I think) it used the VW beetle clutch and pressure plate (it has the same bolt pattern as the Alfa). This kit is not sold anymore. All these kits have different pros and cons, you will have to decide which one is best for yourself. Thanks Gerrelt thats really helpful. My engine has already got an adaptor plate fitted as it was previously fitted to a beetle. I’ve no idea what type it is. I guess I’ll need to remove my gearbox and fit them together to see if the imput shaft reaches and the clutch functions. If you send me a picture of your adapter plate and flywheel, maybe I can recognize the type of adapter kit. Either way, good luck with your project! Thanks Gerrelt I’ll do that! My name is Dinake,i’m in South Africa.I really like your conversion.I have a Alfa 147 twinspark that i want to use as a donor car for my bay window van. Kindly advice me what to do and what kind of adapter plate or kit to use.My biggest challenge is that there is no company that offers such kits in South Africa for the Alfa conversion,please help!!! As far as I know, the 147 twinspark has an inline 4 cilinder engine, and not a boxer engine like my Alfa engine. I am sorry, but I don’t know of any company that sells an adapter plate for that engine. I think you would have it easier if you went with a Subaru engine. There are Australian shops that sell adapter plates for them. Maybe there are even South African shops that sell them too?